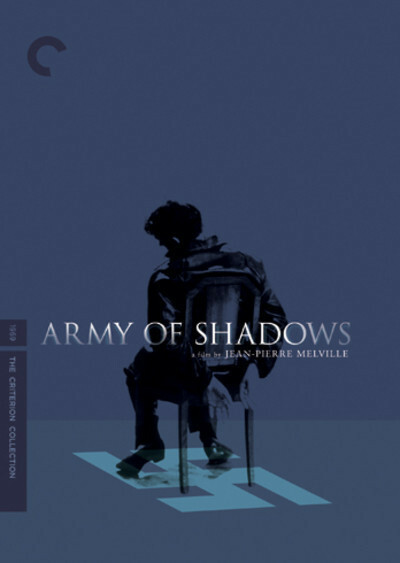 Jean-Pierre Melville's "Army of Shadows" is about members of the French Resistance who persist in the face of despair. Rarely has a film shown so truly that place in the heart where hope lives with fatalism. It is not a film about daring raids and exploding trains, but about cold, hungry, desperate men and women who move invisibly through the Nazi occupation of France. Their army is indeed made of shadows: They use false names, they have no addresses, they can be betrayed in an instant by a traitor or an accident. They know they will probably die. This is not a war film. It is about a state of mind. Under the Vichy government of the World War I hero Petain, France officially permitted the Nazi occupation. Most Frenchmen accepted it as the price of immunity from German armies. DeGaulle runs the Free French movement from London but is a voice on the radio and commands no troops -- none except for those in the Resistance, who pose as ordinary citizens, lead two lives, spy on the Germans, provide information to the Allies and sometimes carry out guerrilla raids against the enemy. Many films have shown such actions. Melville, who was himself a member of the Resistance, is not interested in making an action film. Action releases tension and makes it external. His film is about the war within the minds of Resistance members, who must live with constant fear, persist in the face of futility, accept the deaths of their comrades and expect no reward, except the knowledge that they are doing the right thing. Because many die under false names, their sacrifices are never known; in the film, two brothers never discover that they are both in the Resistance, and one dies anonymously. As one of his films after another is rediscovered, Melville is moving into the ranks of the greatest directors. He was not much honored in his lifetime. We now know from his gangster film "Bob le Flambeur" (1955) that he was an early father of the New Wave -- before Godard, Truffaut, Malle. He used actual locations, dolly shots with a camera mounted on a bicycle, unknown actors and unrehearsed street scenes, everyday incidents instead of heightened melodrama. In "Le Samourai" (1967), at a time when movie hit men were larger than life, he reduced the existence of a professional assassin (Alain Delon) to ritual, solitude, simplicity and understatement. And in "Le Cercle Rouge" (1970), he showed police and gangsters who know how a man must win the respect of those few others who understand the code. His films, with their precision of image and movement, are startlingly beautiful. Now we have the American premiere of perhaps his greatest film (I have not seen them all, but I will). When "Army of Shadows" was released in 1969, it was denounced by the left-wing Parisian critics as "Gaullist," because it has a brief scene involving DeGaulle and because it involves a Resistance supporting his cause; by the late 1960s, DeGaulle was considered a reactionary relic. The movie was hardly seen at the time. This restored 35mm print, now in art theaters around the country, may be 37 years old, but it is the best foreign film of the year. It follows the activities of a small cell of Resistance fighters based in Lyons and Paris. Most of them have never met their leader, a philosopher named Luc Jardie (Paul Meurisse). Their immediate commander is Philippe Gerbier, played by Lino Ventura with a hawk nose and physical bulk, introspection and implacable determination. To overact for Ventura would be an embarrassment. Working with him is a woman named Mathilde (Simone Signoret), and those known as Francois (Jean-Pierre Cassel), Le Masque (Claude Mann) and Felix (Paul Crauchet). "Does your husband know of your activities?" Mathilde is asked one day. "Certainly not. And neither does my child." Signoret plays her as a mistress of disguise, able to be a dowdy fishwife, a bold whore, even a German nurse who with two comrades drives an ambulance into a Nazi prison and says she has orders to transport Felix to Paris. The greatness of her deception comes not as she impersonates the German-speaking nurse, but when she is told Felix is too ill to be moved. She instantly accepts that, nods curtly, says "I'll report that," and leaves. To offer the slightest quarrel would betray them. The members of this group move between safe houses, often in the countryside. When they determine they have a traitor among them, they take him to a rented house, only to learn that new neighbors have moved in. They would hear a gunshot. A knife? There is no knife. "There is a towel in the kitchen," Gerbier says. We see the man strangled, and rarely has an onscreen death seemed more straightforward, and final. To protect the security of the Resistance, it is necessary to kill not only traitors but those who have been compromised. There is a death late in the film that comes as a wound to the viewer; we accept that it is necessary, but we do not believe it will happen. For this death of one of the bravest of the group, the leader Luc Jardie insists on coming out of hiding because the victim "must see me in the car." That much is owed: respect, acknowledgement and then oblivion. There are moments of respite. Airplanes fly from England to a landing field on the grounds of a Baron (Jean-Marie Robain) to exchange personnel and bring in supplies and instructions. Gerbier and Jardie are taken to London for a brief ceremony with DeGaulle and see "Gone With the Wind." Then they are back in France. Yes, there are moments of excitement, but they hinge on decisions, not actions. Gerbier at one point is taken prisoner and sent to be executed. The Nazis march their prisoners to a long indoor parade ground. Machine guns are set up at one end. The prisoners are told to start running. Anyone who reaches the far wall without being hit will be spared -- to die another day. Gerbier argues with himself about whether he should choose to run. That is existentialism in extremis. Because he worked in the Resistance (and because he was working from a well-informed 1943 Joseph Kessel novel), Melville knew that life for a fighter was not a series of romantic scenes played in trench coats, but ambiguous everyday encounters that could result in death. After Gerbier escapes from Gestapo headquarters, he walks into a barber shop to have his mustache removed. The barber has a poster of Petain on his wall. Not a word is said between the two men. A sweating man at night who wants his mustache removed is a suspect. As Gerbier pays and readies to leave, the barber simply hands him an overcoat of another color. Such a moment feels realistic, and is perhaps based on a real event. But "I had no intention of making a film about the Resistance," Melville told the interviewer Rui Nogueira. "So with one exception -- the German occupation -- I excluded all realism." The exploits of his heroes are not meant to reflect real events as to evoke real states of mind. The only big German scene is the opening shot, of German troops marching on the Champs-Elysees. It is one of the shots he is proudest of, Melville said, and to make it he had to win an exemption from a law that prohibited German uniforms on the boulevard. How did the Resistance fighters feel, risking their lives for a country that had officially surrendered? What were their rewards? In 1940, Melville says, the Resistance in all numbered only 600. Many of them died under torture, including Jean Moulin, the original Luc Jardie. Kessel: "Since he was no longer able to speak, one of the Gestapo chiefs, Klaus Barbie, handed him a piece of paper on which he had written, 'Are you Jean Moulins?' Jean Moulin's only reply was to take the pencil from Colonel Barbie and cross out the 's'." On rogerebert.com, there are reviews of "Le Samourai," "Bob le Flambeur" and "Le Cercle Rouge."